pink is the new pink. So last weekend, along with ripping wallpaper down, I did a little painting. By little I mean crafty painting, not wall painting. 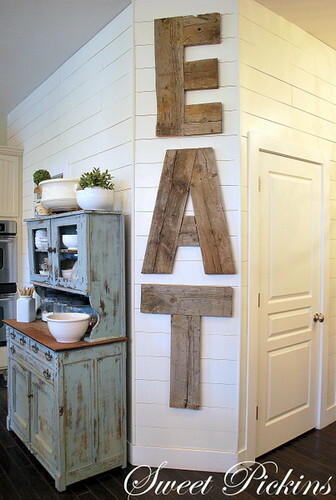 I have been seeing these “eat” signs in kitchens around the internet and really wanted one of my own. I don’t exactly love the font (I would have rather had all lowercase letters – all though capitals are probably better because Italians yell a lot) but I kind of love it. It’s a shout out to my pap/my Italian heritage/the one word in Italian I know. 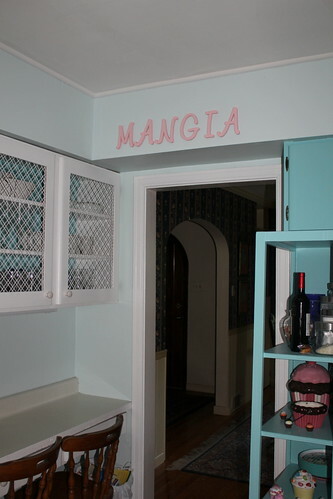 It’s not as crooked as it looks, I just took the picture from that angle to get both of my kitchen colors in. And you can see my cupcake collection on the shelf. I wasn’t sure where to put it but I figured telling people to eat on their way into the dining room made the most sense! 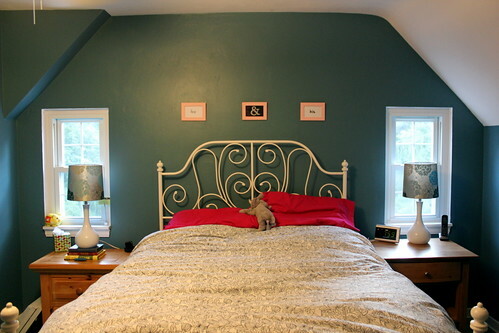 I also did a little painting in the bedroom, painting these cheap birch frames from Ikea pink. I was struggling with what to put in them since they are so teeny tiny and thought I’d do a little take on “his and hers” but backwards, since that’s how we sleep. I’ll actually probably swap them out for a bigger font, but I just wanted to test and see how it looked. I did the hers in a swirly font and the his in a less swirly font (even though Keith has prettier handwriting). I also bought us some lamps! I had a tiny little Ikea lamp on my table and Keith had nothing on his. 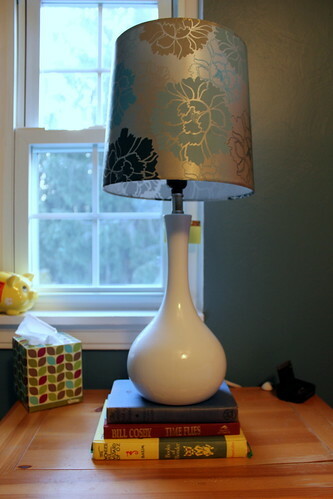 My lamp wasn’t bright enough and I really wanted matching lamps since we don’t have matching side tables. In case you haven’t noticed, lamps are EXPENSIVE. I have been hunting for months to try to find something in a shape I liked that wasn’t 40$ a lamp. I was at Walmart buying the pink paint for my letters/frames and stumbled upon these babies for 14$! They were a great shape and although they were shadeless I grabbed the last two and figured I could deal with finding shades later. And then on the other side of aisle, I spotted these shades, which were pretty much perfect. All blues and silvers, which is right up my alley! The shades were only 6$ so I got two lamps and two shades for cheaper than I could find one single lamp. I am pretty excited. For some reason, it makes me feel more grown-up/sophisticated having matching lamps. I think they make the bedroom so cozy. Keith said we didn’t need new lamps, but he already used his, so I think I win this round. I am almost ready to call the bedroom complete but I still want a long dresser for across from the bed. I also want to paint it pink. I’m so lucky Keith lets me do whatever I want in regards to decorating. I think he’d stop me if he totally hated something, but I’m not really sure, haha. I have totally been slacking on any house-related things, so I really have nothing to show. 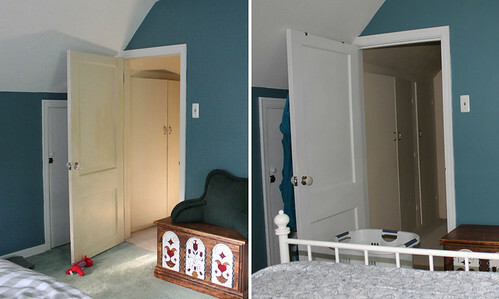 I did finally get around to painting the doors/trim in the bedroom and man, do I hate trim. 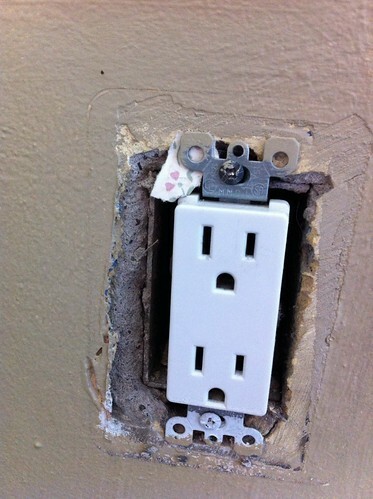 I was ready to finally give in and use painter’s tape…but then I couldn’t find it. And I did eventually find it, after I had already finished. So the trim is not perfect and I absolutely refuse to do a second coat, but I’m fine with that. I’m going to my mum’s tomorrow for the 4th of July and even though I originally told her I was going to bring a baked good, I kind of went overboard and am planning on making 3 different treats, (as long as I can finish this paper!!) so I’ll definitely have some pictures of those after tomorrow and probably a few thousand of my adorable nephew, Bradley. Sunday was the day I had been waiting 2 months for: Ikea trip! We are lucky that we have an Ikea here in Pittsburgh, but from the North Hills, it’s not exactly close. We also didn’t think we could fit the things we needed to buy in either of our cars, but luckily Keith’s mom let us borrow her Subaru. So we were in and out of Ikea in 47 minutes, which included walking all around the show floor, loading our furniture on the dolly-thing, paying and unloading into the car. I could spend 2 hours in Ikea without buying a thing, so I was pretty impressed. We then came home and lugged it up two flights of stairs, because everything was intended for the bedroom. 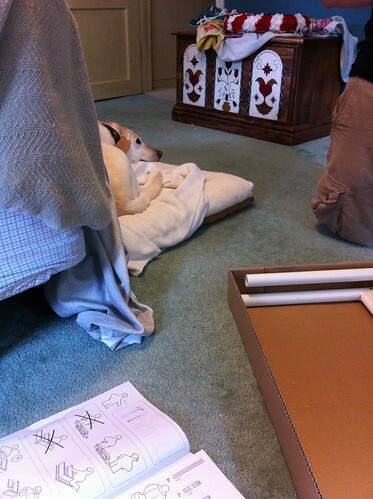 Daisy came up to hang out on her bed while we built our bed. We got the Leirvik, which along with being the bed we liked the most, was only 89$. 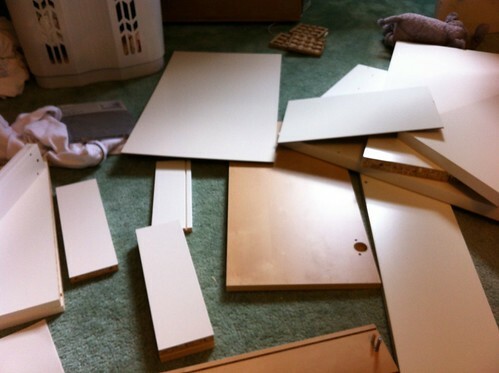 It took less than an hour to put together as it’s only like 6 pieces. 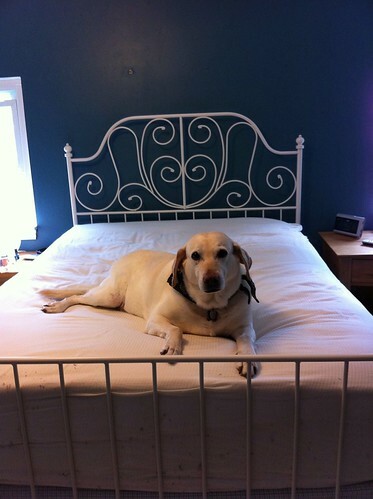 We opted not to buy the bed slats, as we had a box spring, but as soon as we got the mattress on, I regretted that. 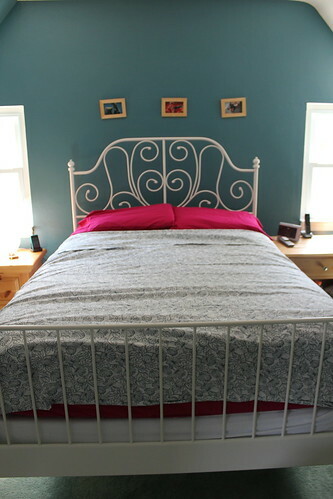 With the box springs and the mattress, our bed is just about 75ft tall. 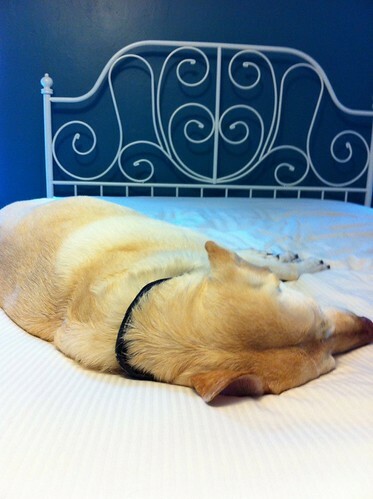 I was afraid Daisy wouldn’t be able to get in the bed, so we called her back up to test it. She actually spent the next three hours up there which is unheard of for her. She prefers to floor to anything (couch, bed). The more I look at the bed, the more I think we might just keep it like that. (I had initially wanted to go back and get the slats so we could lose some height.) I think it might look weird with more of those vertical bars sticking out. While Daisy snoozed, I went to work building my desk. 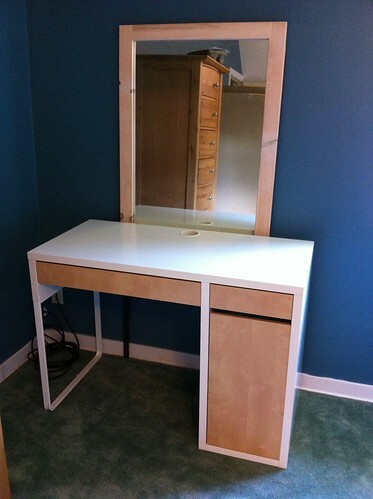 I got the Micke desk to use as a vanity because I was sick of using the edge of the bathroom sink. It took me 2-3 hours to put together. It says it’s a two person job, but aside from 2 instances where I had to call for Keith, I did it all myself. I had planned to buy a rectangular mirror to hang on the wall behind it, but I found this mirror at a garage sale for 5$ and figured I could just use it. I didn’t like the curved top, so I unscrewed the legs and flipped it upside down! After I took this, I ended up moving it even higher so you don’t see the reflection of the back of the desk because that was really bugging me. The desk is also neat in that you can build it with the cupboard on either side. My original plan was to paint the mirror glossy white, but it kind of goes how it is, so I will probably let laziness prevail and leave it as is. Until I decide it drives me crazy. I didn’t buy a chair for it yet, I’m just using an old dining room chair for now. Keith suggested that so I can decide what height I want the chair to be. He’s so smart. After the bed was all together, I went to put a sheet on it and got so fed up with the sheets not fitting (our mattress is too deep), I made it my mission on Monday to acquire new sheets. (Side note: I thought I was buying a set of sheets at Ikea, but I got home and realized it was a duvet cover. Oh well.) After scouring online reviews, I ran to Target after work and got some sheets that fit! 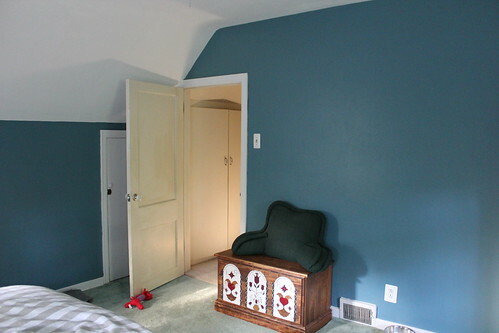 Except I kind of forgot what color the bedroom walls were and ending up matching the sheets to the future dining room color, so they don’t match the bedroom walls exactly, but they sure are soft. 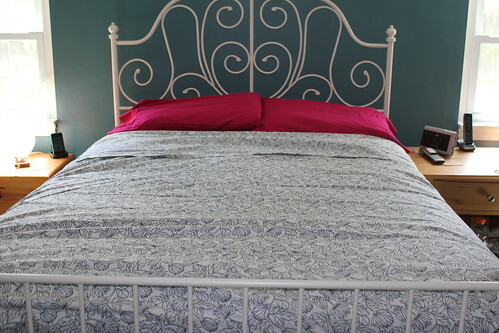 Hooray for new sheets and new furniture! Very, very beige. 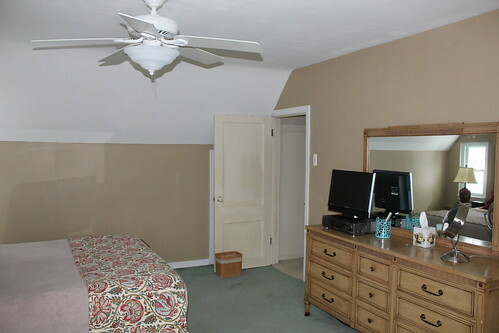 I’m not into beiges/taupes/off-whites in any form, though the previous owners LOVED them, in all shades, in all rooms. My preferred neutral is grey, so room by room, I am banishing the beige. This was the room after the first night. I felt like I was sleeping in a haunted house or squatting or something. See that white piece of wall/ceiling over the window on the right? 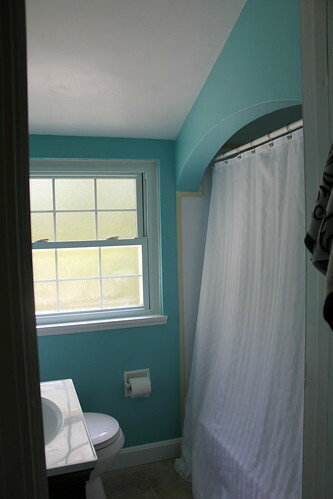 I went back and forth for DAYS (even before I started painting) trying to decide if I wanted to leave it white and pretend it was ceiling or paint it blue and pretend it was wall. They had obviously pretended it was ceiling and it sort of drove me crazy. I thought it might look different when everything was blue so I left it momentarily and it drove me even more insane, so I painted over it the next day. I think it was the right choice. Also don’t mind the dog toy holding open the door, Daisy won’t play with them so we need to use them for something. I took the pictures at 7pm, so they are a little dark (but still pretty accurate) but I LOVE IT. The room feels so peaceful and calming. 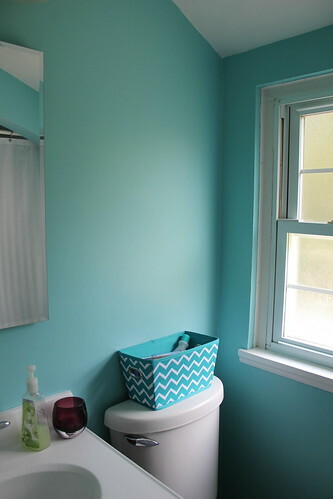 The color is Martha Stewart – Washed Denim, the actual paint is Behr Premium Plus Ultra (which all my paint is and I’ve been really happy with it, paint + primer in one rules). So far I am 3/3 for loving the paints I have picked out! Guess I have a knack for paint! 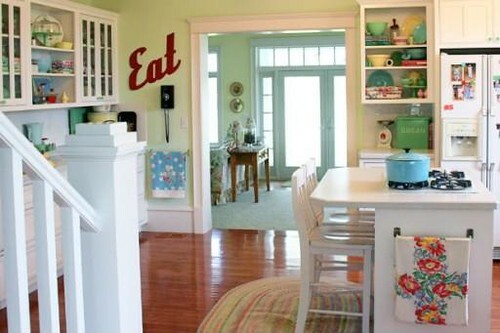 😉 It makes the doors/trim pop like the beige never could and I think it even makes the green carpet look not-so-green (which is a huge plus). My one annoyance with the whole thing was that the Home Depot guy swore up and down that I would need two gallons of paint for the room and I just barely used one! I am either really good at painting or they are scam artists. Never again buying more than one gallon at a time since I now have two untouched gallons of paint (the kitchen and bedroom). They are distinct enough colors that I don’t really want to use them in other rooms, so now I don’t know what to do with them and have 70$ of paint just sitting there. Blah. 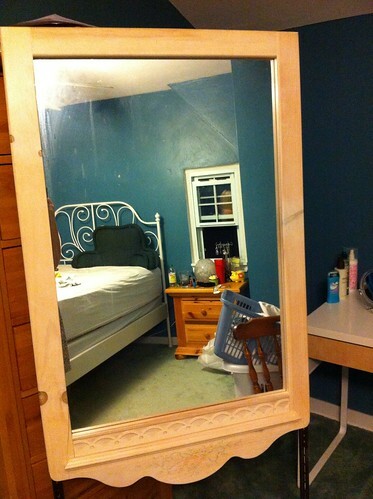 So if anyone needs a gallon of Martha Stewart – Washed Denim or Behr – Embellished Blue, I’ll give you a discount! We still need a bed and some other furniture and I can’t stop thinking that our nightstands need some chrome lamps, but the paint is a huge improvement. 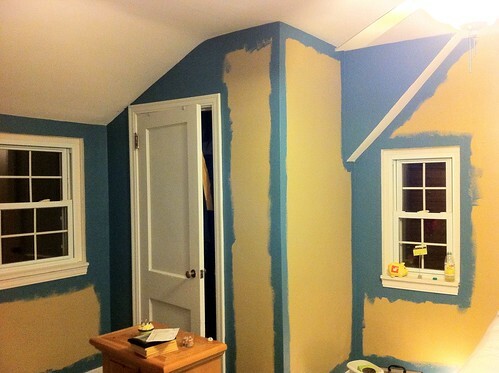 I told myself that after I painted the bedroom, I HAD to get back to the living room and the wallpaper. So that’s my next project. 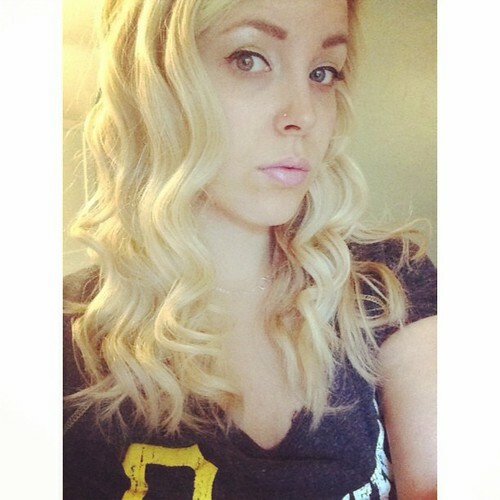 Blah. 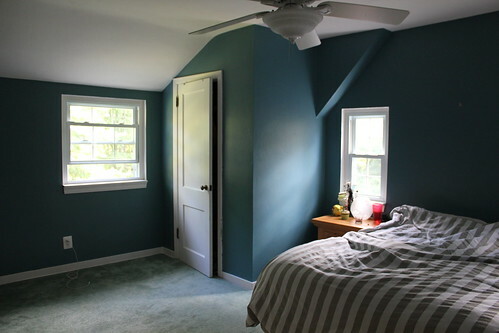 The master bedroom is a pretty nice room. 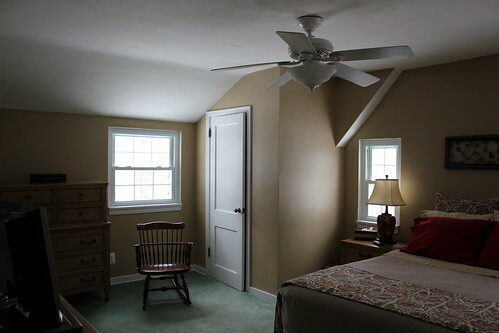 It is a very large room and the three windows (even though two are tiny) bring in tons of light. (Have you noticed I like light?) The closet is pretty big and that white strip behind the off-white (seriously! what is with the nasty off-white color?!) 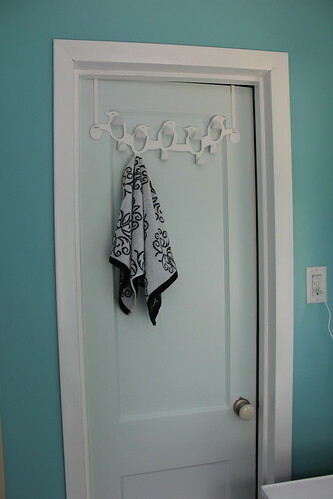 door is a door to more storage space. It actually runs the whole length of the wall, but is more of a crawl space than closet, but will still be great for winter things. -I actually didn’t realize the carpet was green until after we closed. I hate green. It’s in fine shape though so I can’t justify replacing it yet. But one day. -A bedframe. We have a plan metal bedframe that the bed sits on, but no head/footboard. 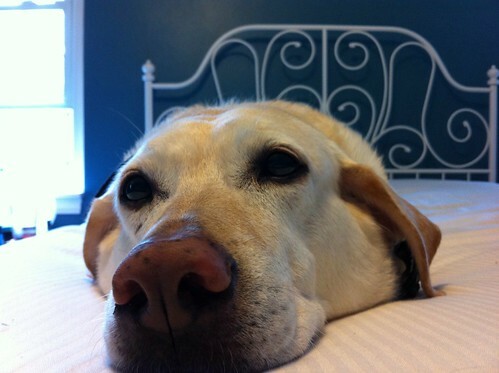 We want something, but don’t want to spend a ton because we eventually want to upgrade from our full sized bed. -We like this bed from Ikea and it’s only 89$. – I also want a desk that I can use as a vanity since my bathroom is too small. I decided on this desk because it is modern and has some storage. Regular vanities are not my style, have close to no storage and are insanely expensive. This is 79$ and has everything I want. -We also want a low dresser. We have a tall dresser and I feel like we need something low to balance the room. And so I don’t have to keep my jeans on the top shelf of the closet. 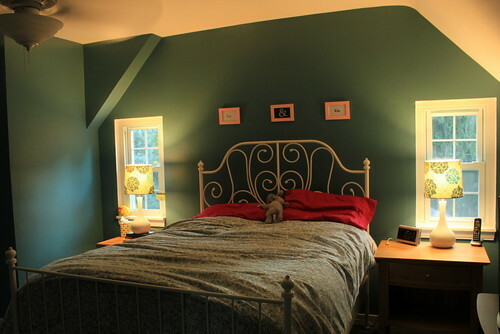 The bedroom is next on my to-paint list. Which I will eventually get back to. I turned in the last two assingments for my Archaeology class today, so I spend from now until Monday studying for my Phsyical Anthropology final and then I’m freeeee! Until summer term starts. But I’m only taking one online class (Abnormal Psych) so hopefully it won’t take up too much of my time.